Akyüz, Y. and K. Boratav 2003 “The Making of the Turkish Financial Crisis.” World Development. 31(9): 1549-66. Alper, E. C. 2002 “Business Cycles, Excess Volatility and Capital Flows: Evidence from Mexico and Turkey.” Russian and East European Finance and Trade. 38(4): 22-54. Alper, E. C. and Z. Onis 2002 “Emerging Market Crises and the IMF: Rethinking the Role of the IMF in the Light of Turkey’s 2000-2001 Financial Crises” Paper Presented at the METU International Conference September 11-14, Ankara. Ataman, M. 2002 “Leadership Change: Ozal Leadership and Restructuring in Foreign Policy.” Alternatives: Turkish Journal of International Relations. 1(1) http://www.alternativesjournal.net/volume1/number1/ataman.htm. Bonner, A. 2005 “Turkey, the European Union and Paradigm Shifts.” Middle East Policy. 12(1): 44- 71. Cizre, Ü. and E. Yeldan 2005 “The Turkish encounter with neo-liberalism: economics and politics in the 2000/2001 crises.” The Review of International Political Economy. 12(3): 387-408. Demir, F. 2004 “A Failure Story: Politics and Financial Liberalization in Turkey, Revisiting the Revolving Door Hypothesis”. World Development. 32(5): 851-69. DPT (Devlet Planlama Teşkilatı) 2001 Uzun Vadeli Strateji ve Sekizinci Beş Yıllık Kalkınma Planı. Ankara: DPT. http://www.dpt.gov.tr. DPT 2006a Ekonomik ve Sosyal Göstergeler 1950-2004. Ankara: DPT. http://www.dpt.gov.tr. DPT 2006b 2006 Yılı Programı. Ankara: DPT. http://www.dpt.gov.tr. http://ekutup.dpt.gov.tr/ekonomi/gosterge/tr/1950-06/esg.htm, accessed 10 March 2008.
http://www.ecosecretariat.org/Detail_info/About_ECO_D.htm, accessed 20 February 2008. Economist 2006 “Linking hands across the Steppes”, June 3-9, p. 48. London. Ekinci, N. K. 1997 “Financial Liberalization under External Debt Constraints: The Case of Turkey” in Gupta, K. L. (ed. ), Experiences with Financial Liberalization. Boston; London: Kluwer, 243- 66. Eralp, A. 1993 “Turkey and the European Community in the Changing Post-War International System” in Balkir, C. and A. M. Williams (eds. ), Turkey and Europe. London and New York: Pinter Publisher, 24-44. Erdilek, A. 2003 “A comparative analysis of inward and outward FDI in Turkey”. Transnational Corporations. 12(3): 79-105. Esen, O. 2000 “Financial Openness in Turkey”. International Review of Applied Economics. 14(1): 5- 23. Gates, A. 2005 “Negotiating Turkey’s Accession: The Limitations of the Current EU Strategy”. European Foreign Affairs Review. 10(3): 381-97. Herzig, E. 2004 “Regionalism, Iran and Central Asia”. International Affairs. (May): 503-17. Kösebalaban, H. 2002 “Turkey’s EU Membership: A Clash of Security Cultures.” Middle East Policy 12(June): 130-146. Kramer, H. 2000 A Changing Turkey. Washington, DC: Brookings Institution Press. Larrabee, F. S. and I. O. Lesser 2003 Turkish Foreign Policy in an Age of Uncertainty. Santa Monica and Pittsburgh: RAND. Milliyet, 24 October 2006. Istanbul. Nesadurai, H. E. S. 2005 “The Global Politics of Regionalism: Asia and the Asia-Pacific” in Farrell, M., B. Hettne and L. van Langenhove (eds. ), Global Politics of Regionalism. London and Ann Arbor, MI, pp. 155-170. OECD 2006a Factbook. Paris: OECD. OECD 2006b Main Economic Indicators. Paris: OECD. Önder, N. 1998 “Integrating with the Global Market: The State and the Crisis of Political Representation; Turkey in the 1980s and 1990s”. International Journal of Political Economy. 28(2): 44-84. Önder, N. 1997 “International Finance and the Crisis of Neoliberal Economic Strategy in Contemporary Turkey.” Journal of Emerging Markets. 2(3): 21-56. Öniş, Z. 2003 “Domestic Politics versus Global Dynamics: Towards a Political Economy of the 2000 and 2001 Financial Crises in Turkey.” Turkish Studies. 4(2): 1-30. Öniş, Z. and S. Yilmaz 2005 “The Turkey-EU-US triangle in perspective: transformation or continuity?.” The Middle East Journal. 59(2): 265-85. Ozkan, G. F. 2005 “Currency and Financial Crises in Turkey 2000-2001: Bad Fundamentals or Bad Luck?.” The World Economy. 28(4): 541-72. Rugman, A. M. 2005 “Globalization and Regional International Production” in Ravenhill, J (ed. ), Global Political Economy. New York: Oxford University Press, 263-290. Sayari, S. 2000 “Turkish Foreign Policy in the Post-Cold War Era: The Challenges of Multi- Regionalism.” Journal of International Affairs. 54(1): 169-82. Senses, F. 1994 “The Stabilization and Structural Adjustment Program and the Process of Turkish Industrialization: Main Policies and Their Impact” in Senses, F. (ed. ), Recent Industrialization Experience of Turkey in a Global Context. Westport, CT and London: Greenwood, 51-73. Tekin, A. 2005 “Future of Turkey-EU relations: a civilizational discourse.” Futures. 37: 287-302. TÜIK (Türkiye Istatistik Kurumu) 2006 “Dış Ticaret Istatistikleri.” Ankara: TÜIK. http://www.tuik.gov.tr. Üçer, E. 2006 “Turkey’s accession to the European Union.” Futures. 38: 197-211. UNCTAD 2005 Handbook of Statistics. http://www.unctad.org. Wood, S. and W. Quaisser 2005 “Turkey’s Road to the EU: Political Dynamics, Strategic Context and Implications for Europe.” European Foreign Affairs Review. 10(2): 147-73. World Bank 2005 Global Development Finance. Washington, DC: World Bank. http://www.worldbank.org. ISNAD Onder, Nilgun . "THE TURKISH PROJECT OF GLOBALIZATION AND NEW REGIONALISM". 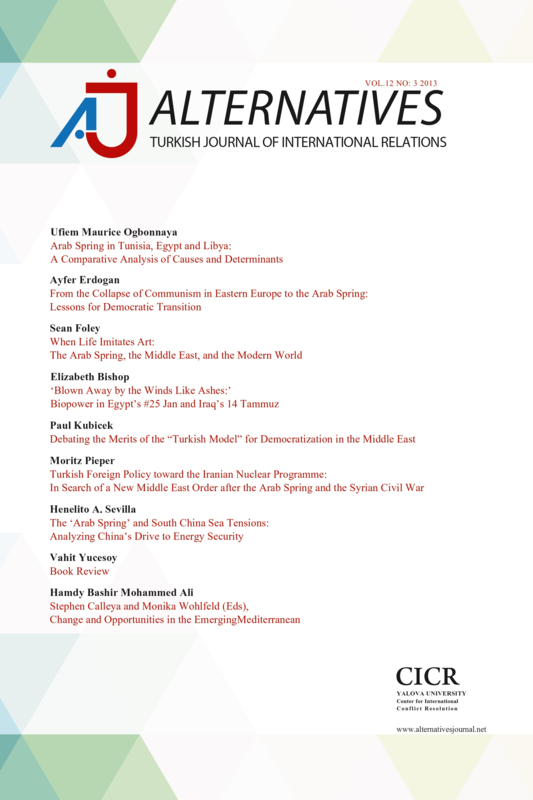 Alternatives: Turkish Journal of International Relations 7 / 2&3 (September 2008): 86-110.